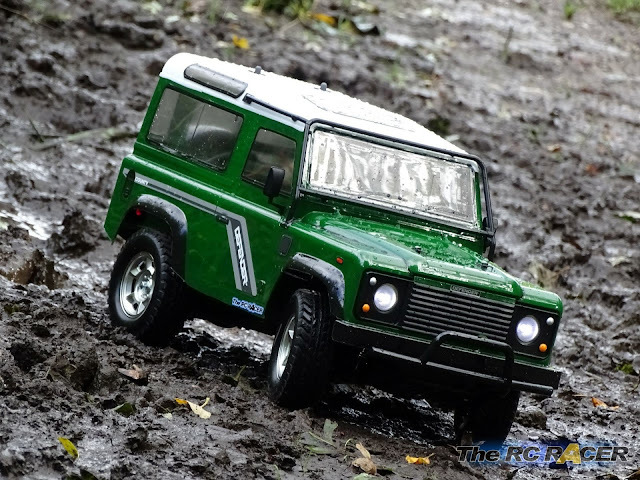 The Land Rover Defender 90 is one of the world's most iconic cars. 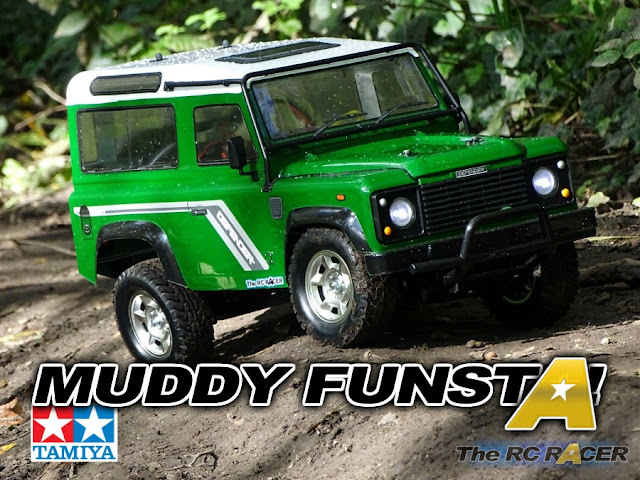 So there was a definite buzz of excitement when Tamiya announced it was going to release a 1/10 scale version of this classic 4wd off roader. The Tamiya CC-01 chassis was instrumental in creating the scale off road scene, so it is fitting to finally have it powering such a popular off road icon. So let's take a closer look and see if it delivers. 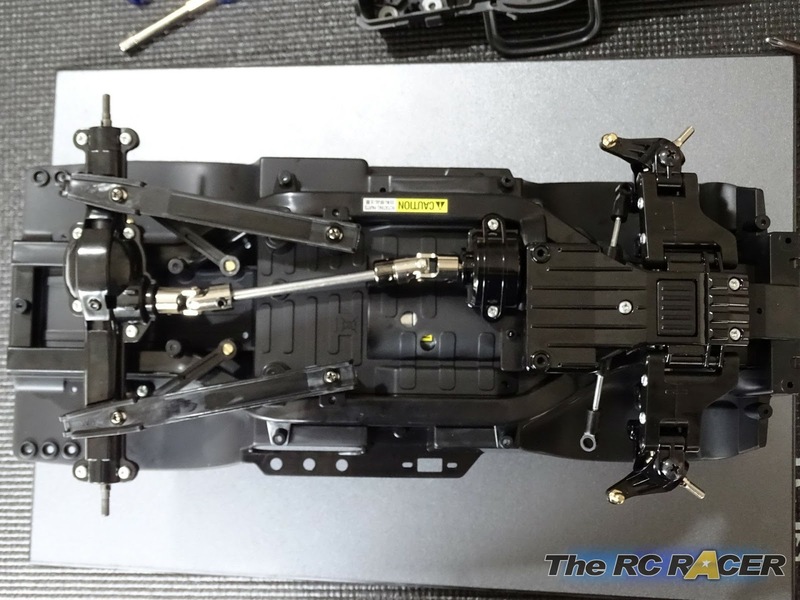 The kit is self assembly, and if you have not made a RC car before you are in for a treat. 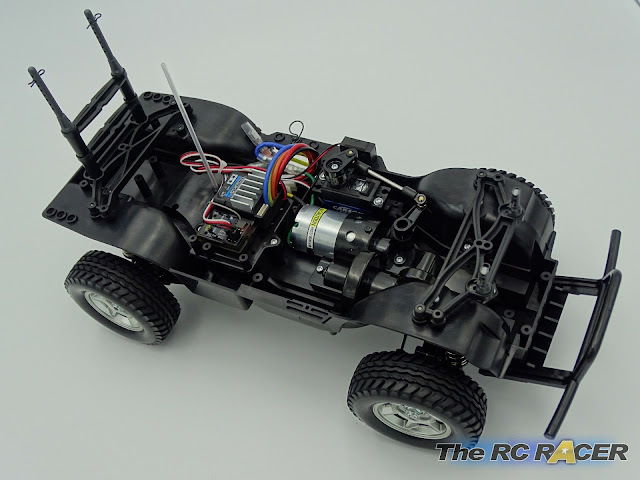 Tamiya kits are renowned for their easy to follow steps, alongside their quality of components. Over the last three decades I have built a lot of Tamiya’s and never had a missing or faulty part. The first thing to do is to read through the manual just to get an idea on what’s involved when building the kit. 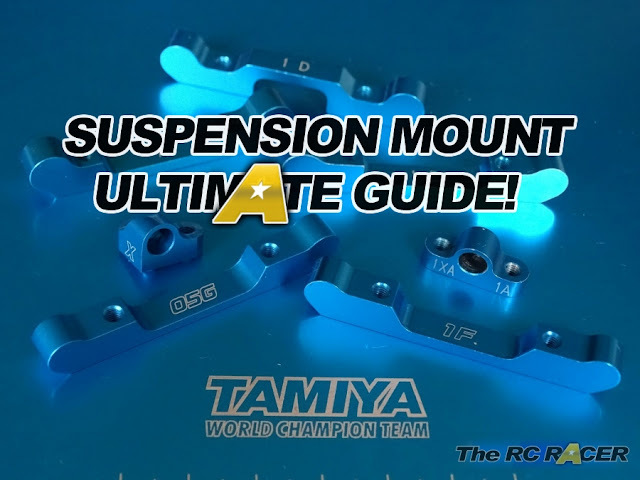 Tamiya manuals are very easy to follow as each of the stages has clear diagrams, making the construction easy to understand. Just take you time on each stage and study the pictures and you will be fine. The following tools are recommended for the build. Sharp knife or curved scissors for the bodyshell. Body reamer or drill bit to make holes in the bodyshell. I would also suggest a craft box or something similar (An empty plastic tub) that you can empty the screw bags into to ensure you do not lose anything on the floor. 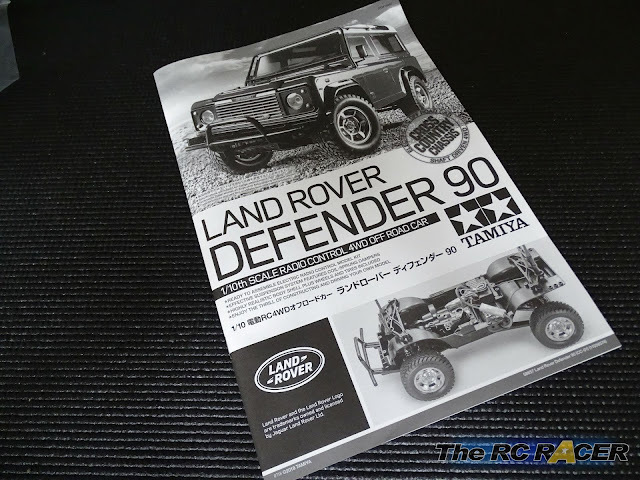 TIP - Tamiya Manuals contain part call-outs which are actual size. This can help you check that you are using the right shaft, screw etc. They can even be used to measure track rods for steering etc. In the kit you will find a selection of bags, as you would expect you need parts from Bag A then Bag B etc. So just empty one bag at a time to ensure you do not get overloaded and to keep the build nice and easy. 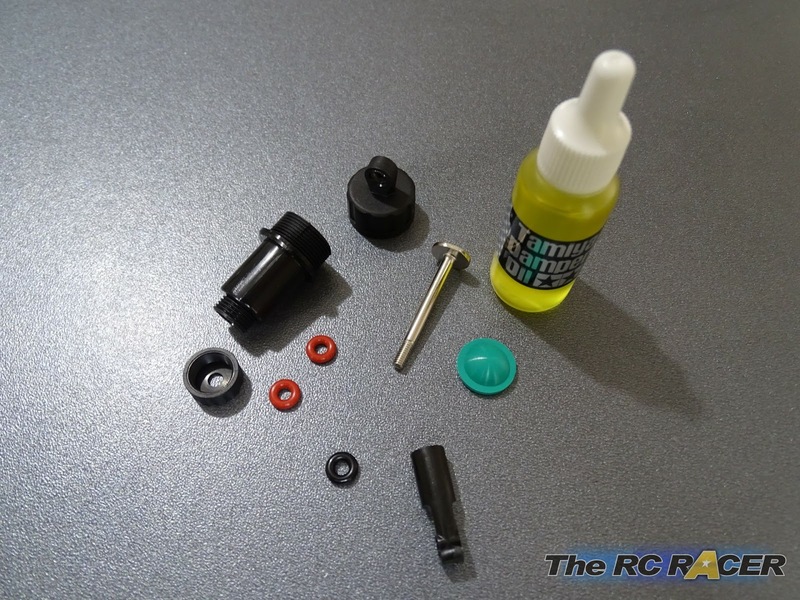 The standard kit comes with bushings that requires greasing. 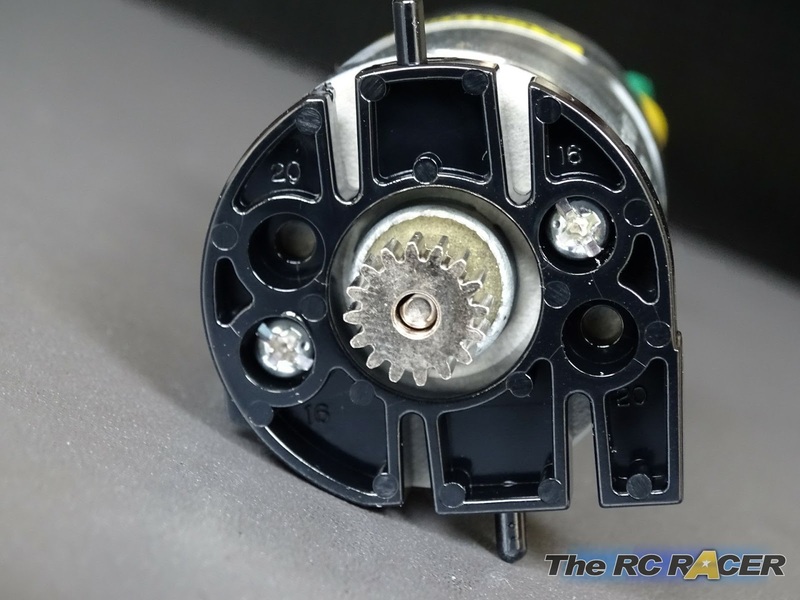 A common hop-up (Tuning part), is to replace these with bearings as they are smoother, freeing up the drive train a little more, and in turn extending the battery life. Just replace the bushings with the equivalent bearing for the build. As this rig will be for going in the dirt, I selected the rubber seals as they are more resistant to dirt. You can swap these in at any time, but as I am building the kit, it is easier for me to swap them for the bushings whilst it is all in pieces. 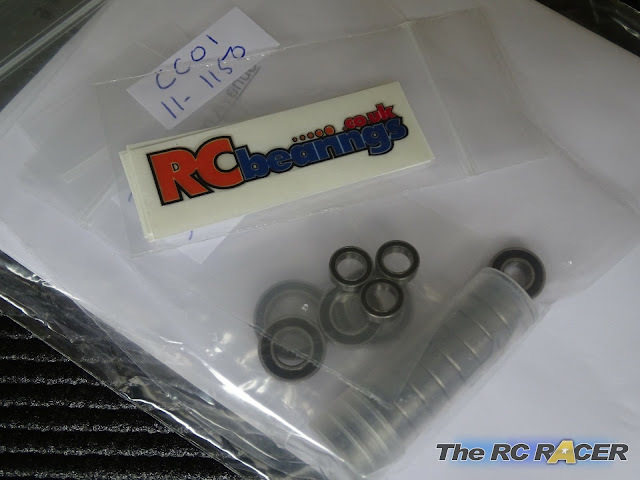 For this build I will be using a set of Bearings from RCbearings.co.uk. We begin with the included 540 motor. 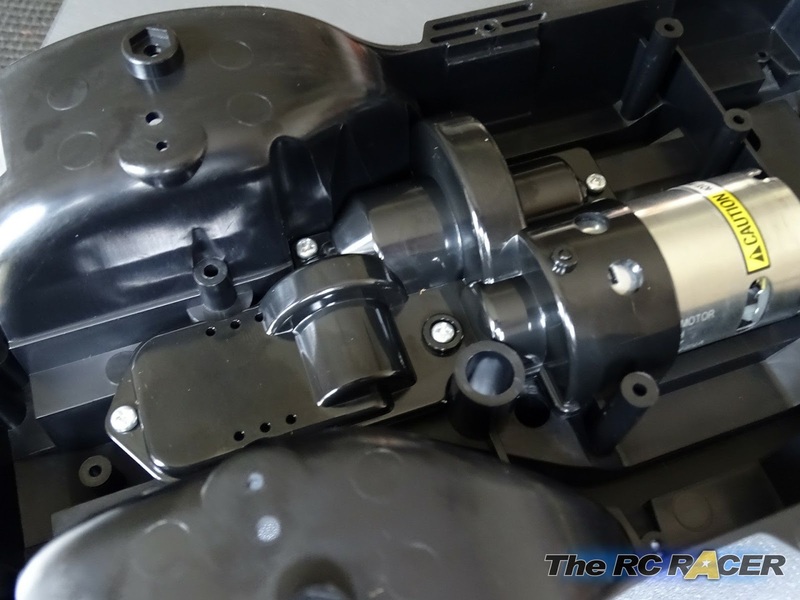 This will provide more than enough speed and torque to hit the trail. You need to fit the 16t pinion onto the end bell with the allen key. 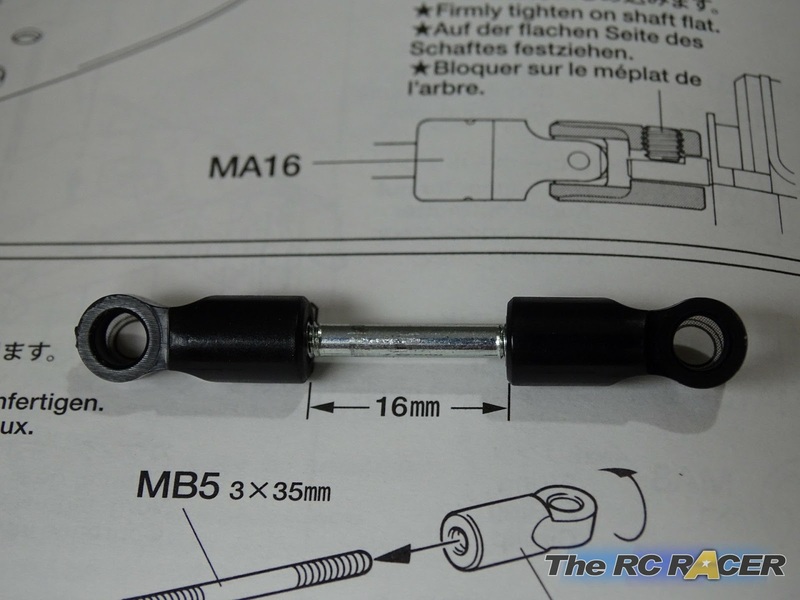 You need to ensure that the pinion is positioned correctly on the shaft, this is easy to do with the included included spacer. Next up we need to attach the motor mount. 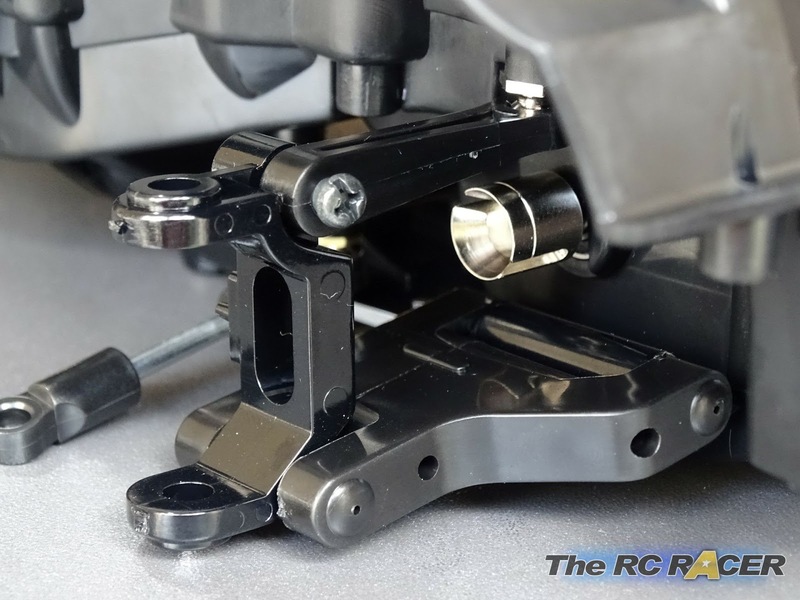 You need to ensure you mount it correctly for the perfect gear mesh. 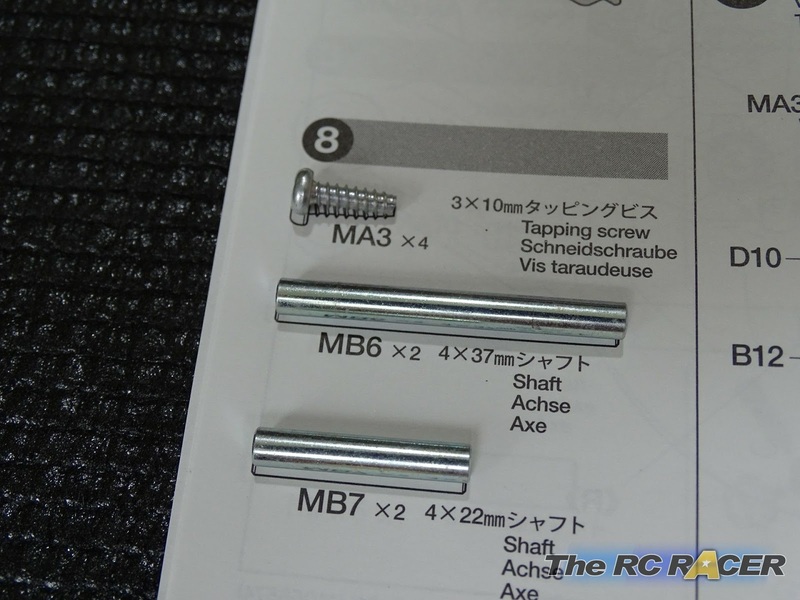 Luckily Tamiya make it nice and easy so you just need to fit the two screws into the corresponding holes marked 16t. 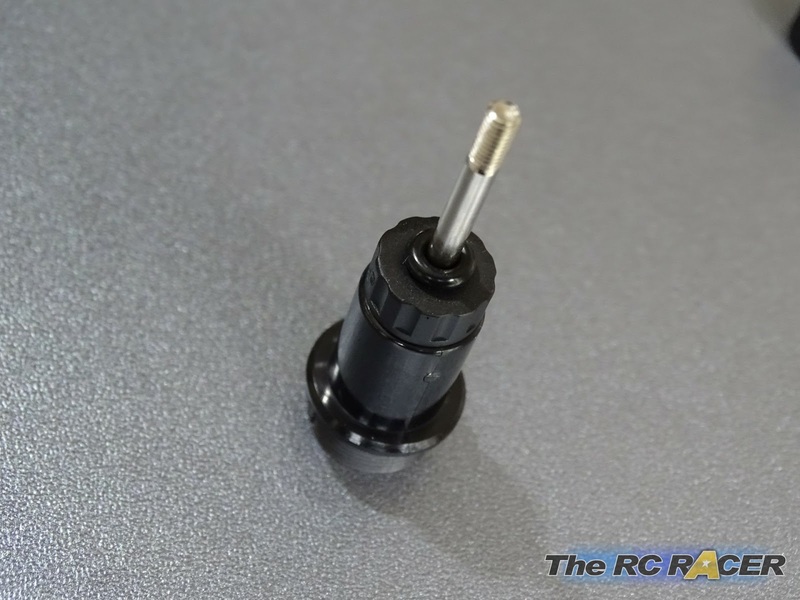 The CC-01 allows you to fit an 20t pinion for higher top speeds (Tamiya part no 50356). Although I personally feel that the 16t is more than quick enough for scale crawling. The front differential is next. 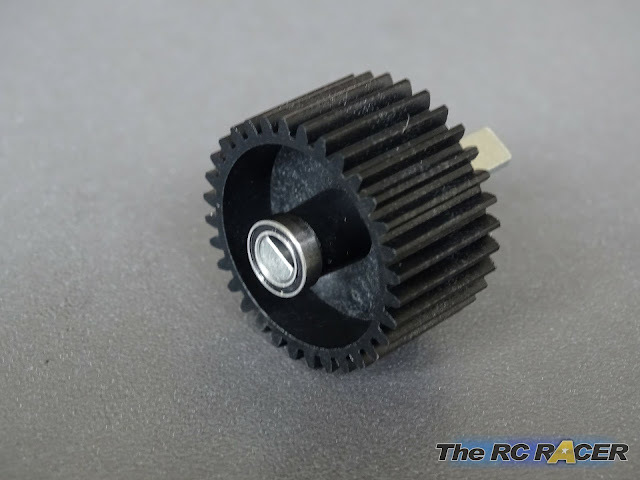 They consist of hard steel gears and star-shafts that are housed in a hard wearing plastic outer case. 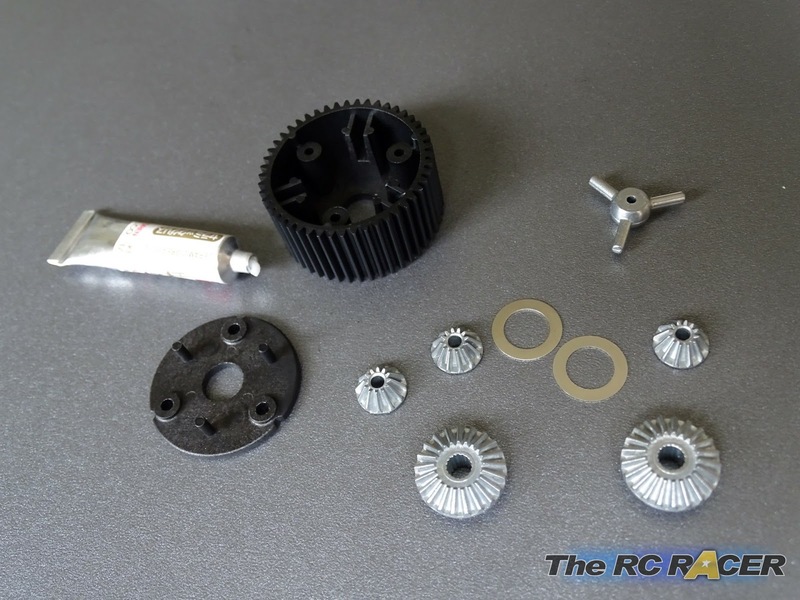 When assembling the differential you want to add a liberal amount of the ceramic grease on the gears to ensure that they run smooth. 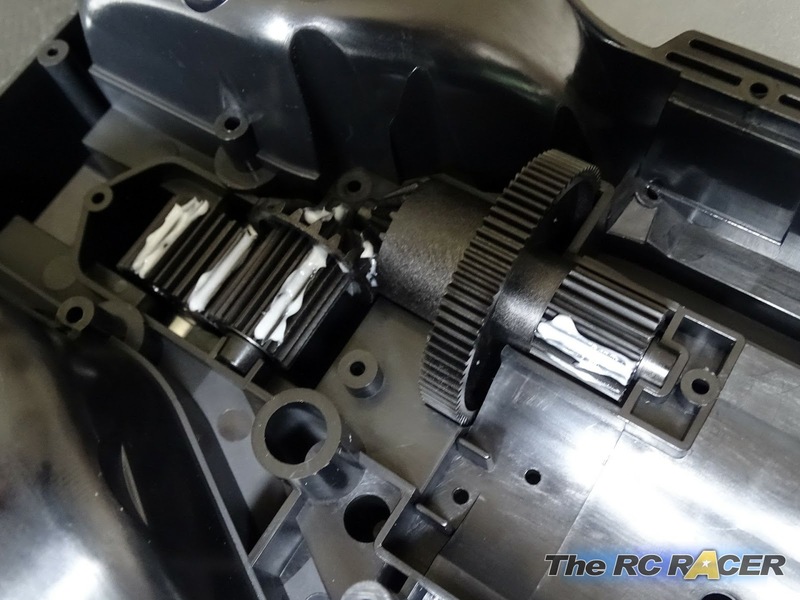 It is popular for some of the more extreme CC-01 runners to lock the front differential. 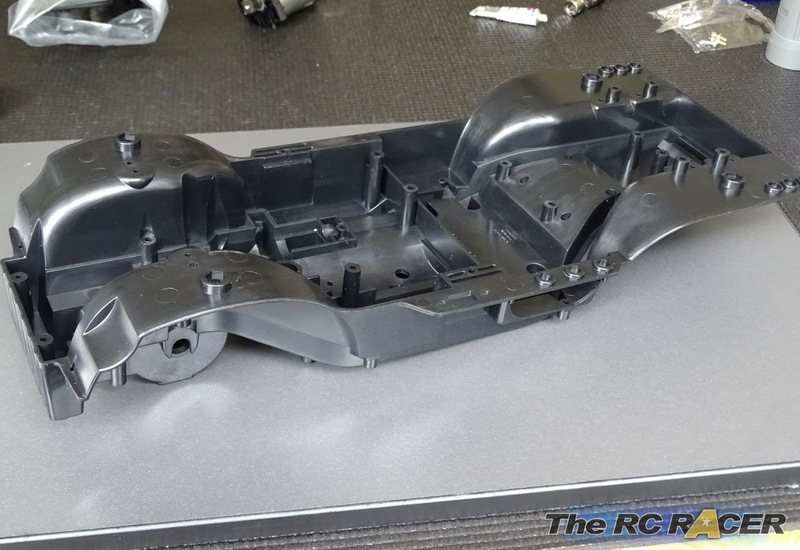 This will allow it to tackle even rougher terrain, but will compromise the amount of steering that the chassis will be able to perform. 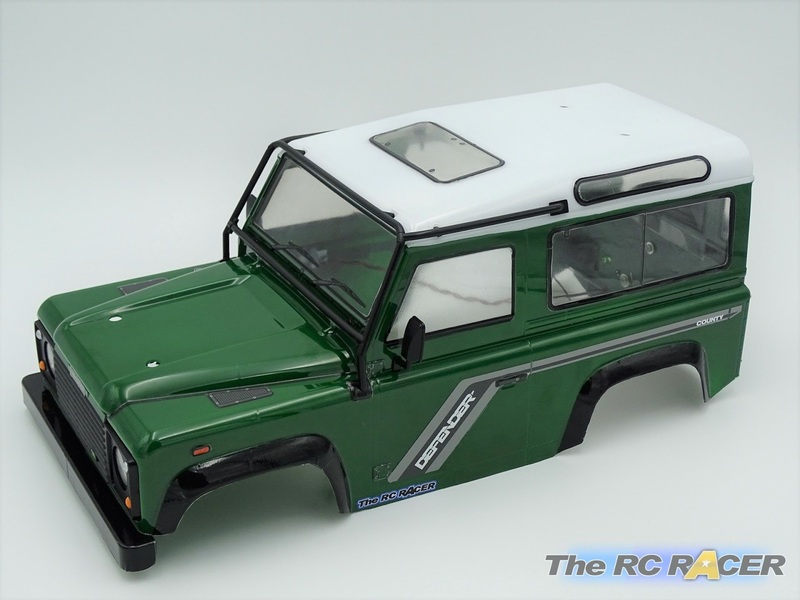 I will do a separate article in a few weeks where I look at tuning options for the CC-01 chassis. 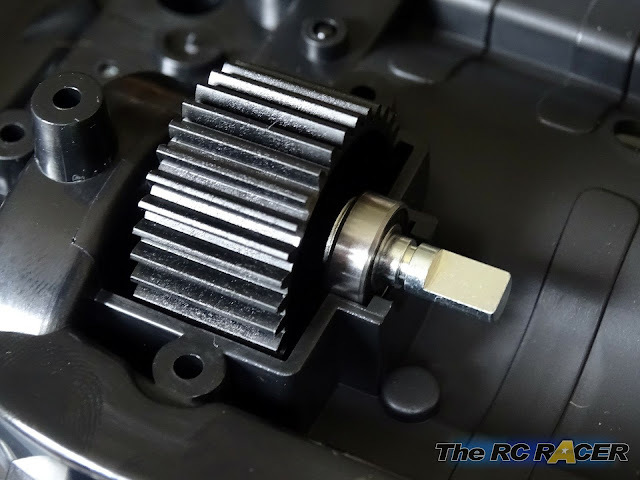 One you have assembled the gears, you finish by attaching the top cover with three screws. Just check everything is seated properly, and it will just fit together with no resistance. We move onto the actual chassis, the CC-01 has a large chassis tub that helps keep out a lot of dirt, and also provides the mounting points for the front gearbox assembly. 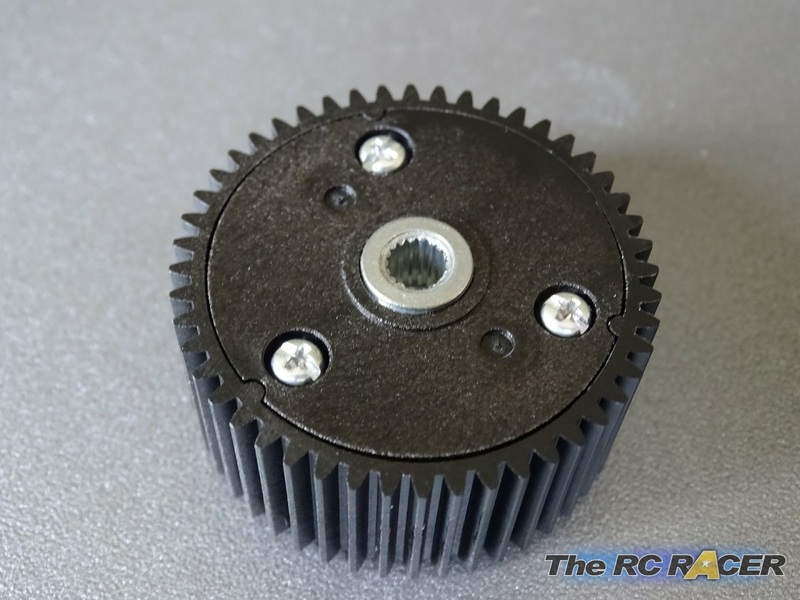 To assemble the gearbox we first place in the differential that we have just built, and then mount the the spur gear and the counter gear. Ensure that you add a little grease on the steel shafts and add a small amount along some of the teeth. 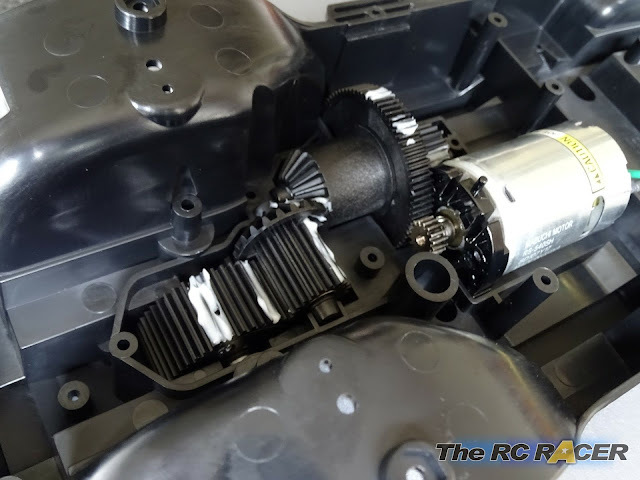 Do not go overboard as its not needed and will make it messy if you ever dissemble the chassis to add new parts or service it. The motor is now mounted alongside the spur gear. 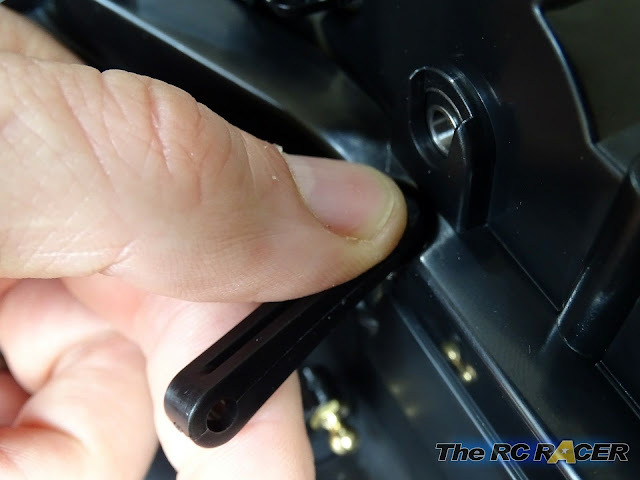 The mount has holes in the lower section that ensure it is all aligned correctly. The front gearbox is closed off with the large plastic cover. The drive gear is next up. This fits on the steel front propeller joint. You have to clip on the large E-Ring (Tip, just wrap the E-Ring and shaft with a bit of kitchen towel before you press down with the pliers. 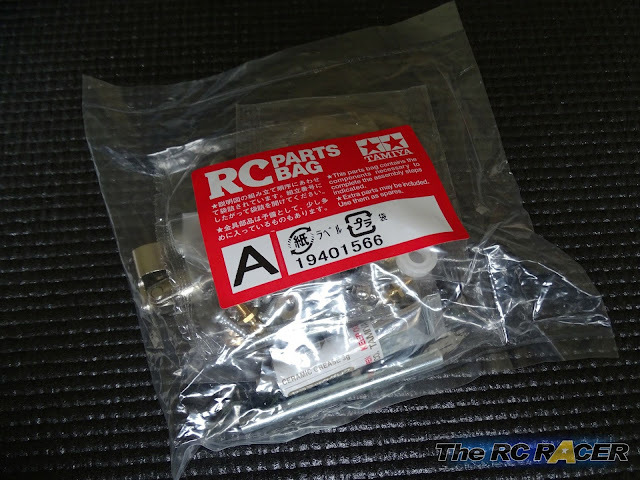 This will stop it flying off if it doesn't attach properly.. although Tamiya does include some spares in the kit). The drive gear is then mounted on the underside of the chassis tub. 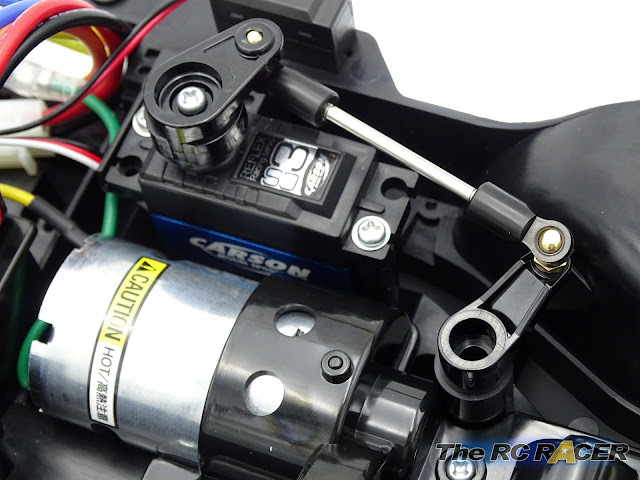 Just check it spins freely and you can then attach the gear cover. Also at this stage you need to attach the front upper shock mounts on the front wheel arches. Now we fit the solid steel propeller shaft. 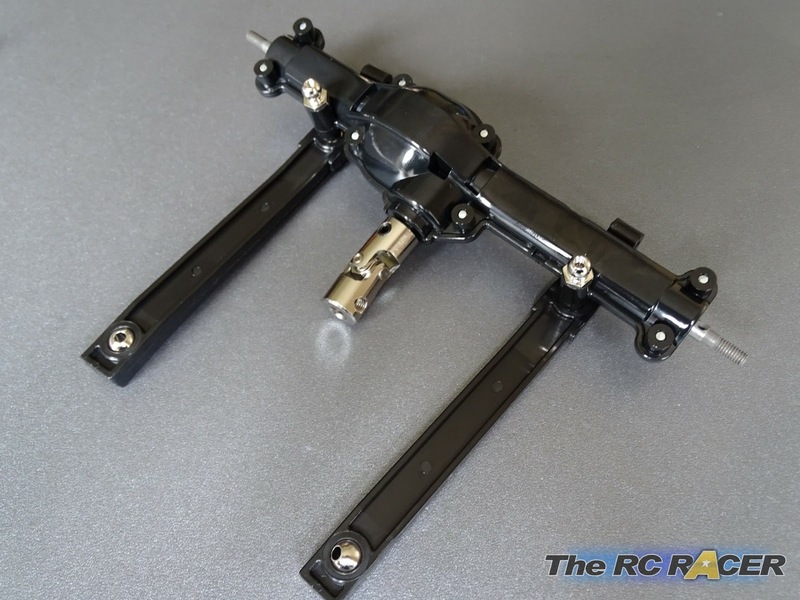 This is a nice heavy piece and you just need to mount it to the flat part of the prop joint by tightening a 5mm grub screw. TIP! Use thread lock on this as otherwise it can come loose. 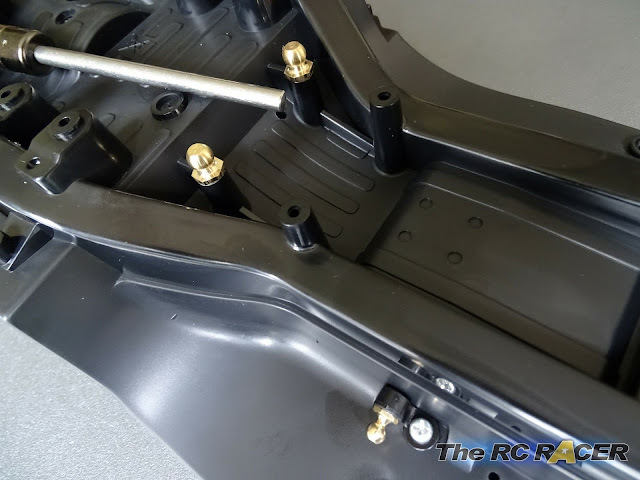 The rear upper shock mounts are also attached on the rear wheel arches. It might seem strange to do these at this stage, but you will find once the front arms are attached that it would be a real pain to mount them as they will be obstructed. Now we get onto Bag B and start working on the steering linkage. As I mentioned earlier the manual is useful to ensure you have steering rods measured correctly, just place it on the diagram to ensure you have the right measurement. 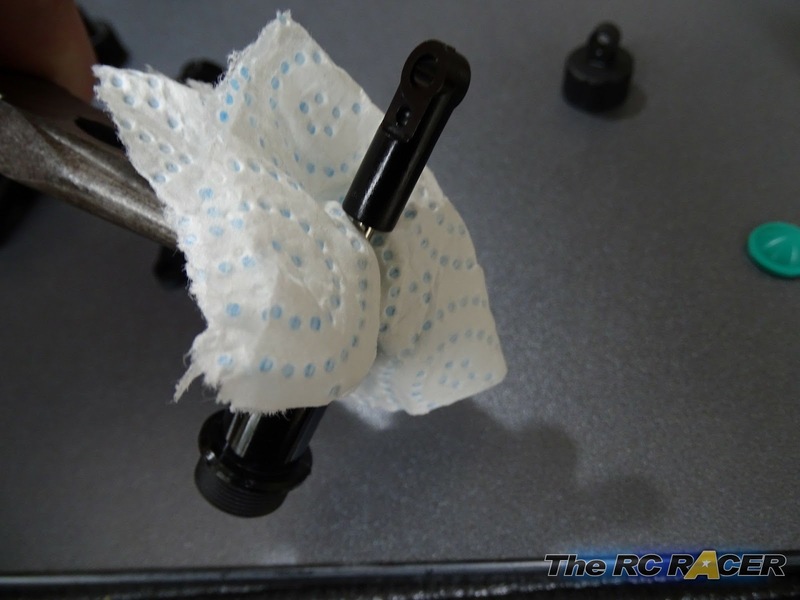 Make sure you thread the Tie-rod the correct way up in the plastic steering arms, and attach the ball cups with a pair of pliers. The front lower arms attach onto the lower skid plate. They are two piece and are held together with screws. Just check that the alignment marks match (the little lines near the inner part of the arms), otherwise you will not be able to fit them correctly. The arms trap a 4x22mm shaft that holds the C-hubs, and 37mm shafts that attach them to the skid plate. When assembled they all move very freely. If yours is stiff, check again as it will compromise the handling. The steering linkage is now attached on the underside of the chassis, screwing it onto a long steering part (B11), that will move it from the top side of the chassis. Again do not over-tighten these screws, the steering should be nice and free and firmly screwed together. 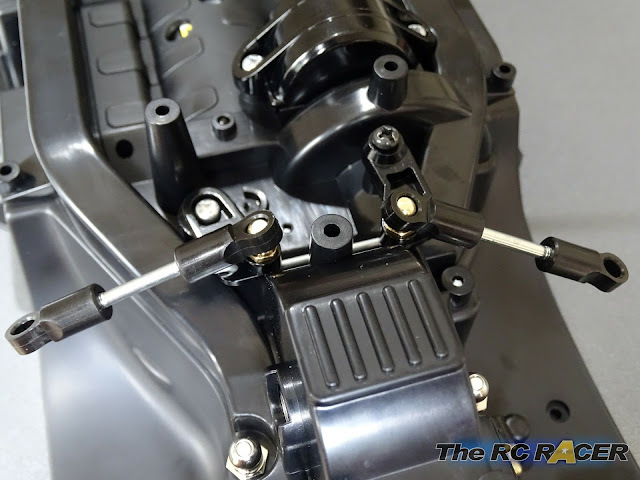 The upper front suspension arms are also clicked into place. Also the front bodymounts are attached, nice and re-enforced to reduce the amount of wiggle that will happen as the D90 drives over the dirt. 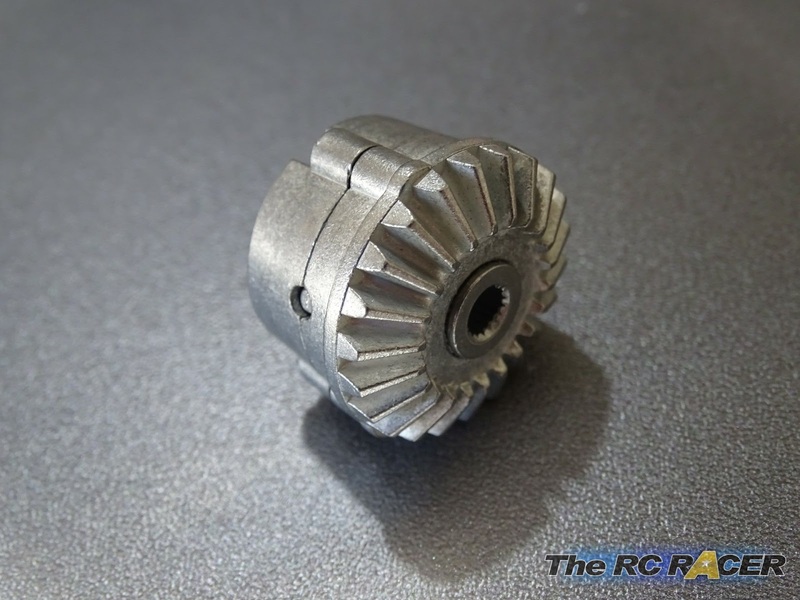 The gearbox joints are attached to the differential, these are made from steel and are hard wearing. 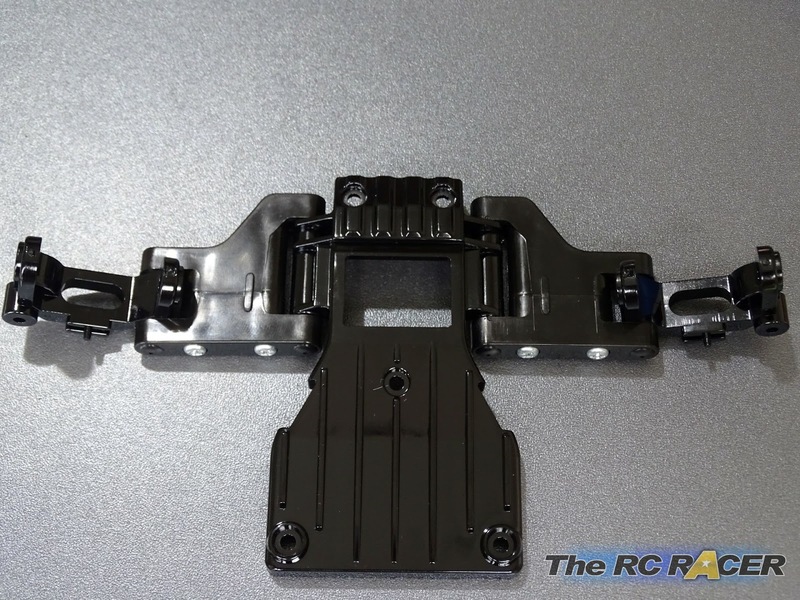 The lower arms are attached via three screws that hold the skid plate to the underside of the chassis. The front uprights are next on the list, ensure you fit the 1280 bearing nice and flush on the inside of the uprights. 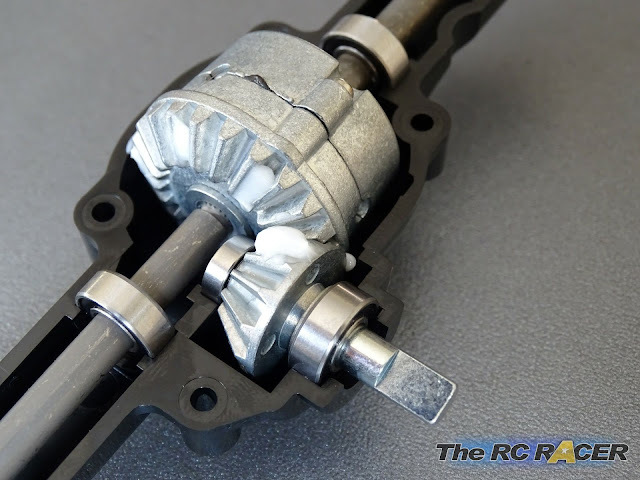 This ensures that the axle will spin freely. 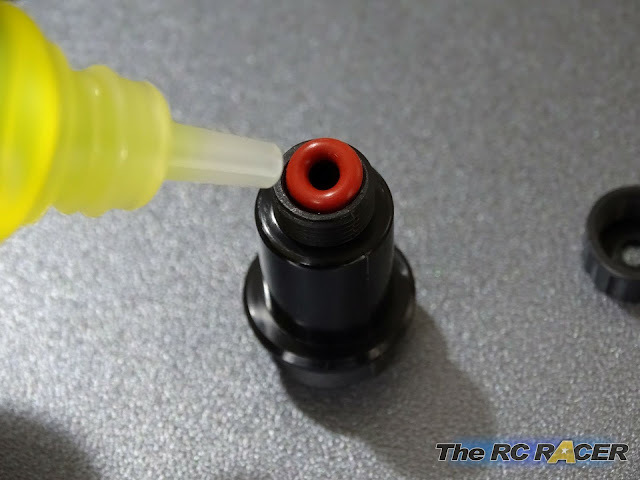 Also push the o-ring in the axle by placing it on the end of your cross head driver so it fits nice and flat in the axle cup. Now just fit the drive shafts in the cups and use the 4x10mm step screws to hold the uprights in place, trapping the driveshafts. We are already on Bag C now, and these next few stages are great fun. 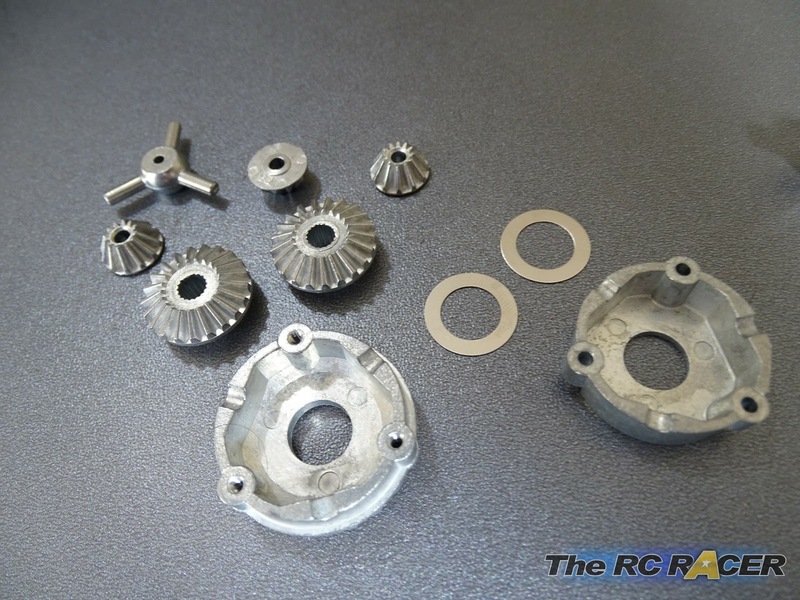 We are building the rear differential. The components are similar to the front diff, but this time we also have a steel diff case. 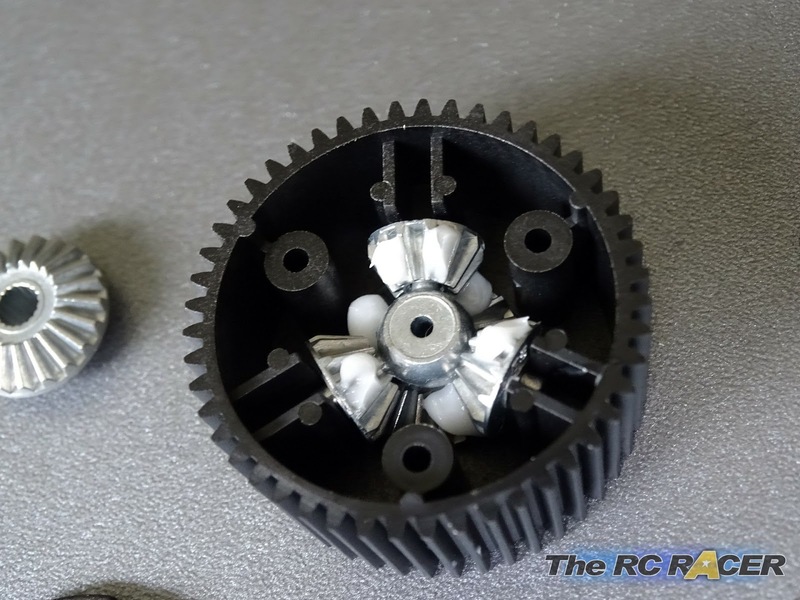 Again you can add grease to the differential, or you can actually lock it by replacing the small bevel gears with the two differential locking parts. A locked rear differential will help you climb easier on slippery surfaces as both wheels will be pushing. The negative is that you will reduce the amount of steering you can achieve slightly. If going on the trails I would personally lock the differential to start with. With your locked (or open) diff internals assembled, you just need to attach the two halves with three screws. Its time to place it in the rear axle case. 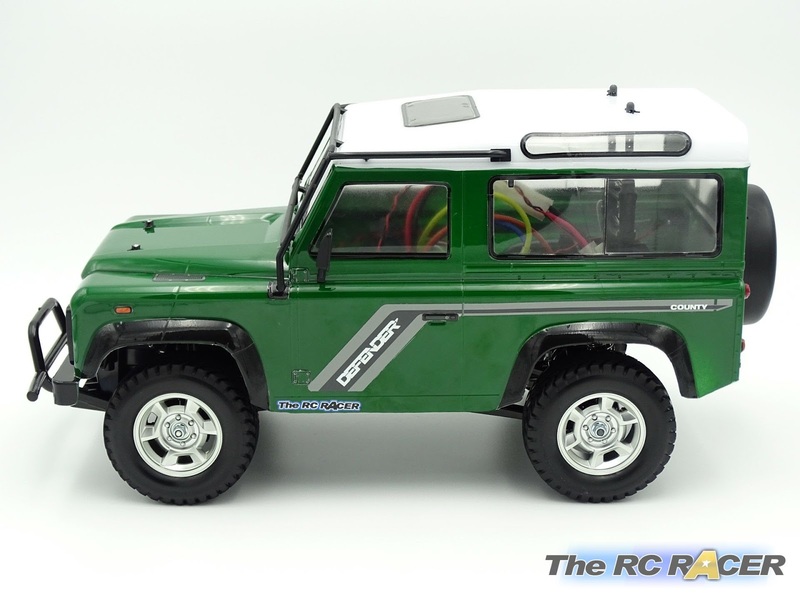 You also need to fit the two steel rear axle shafts. 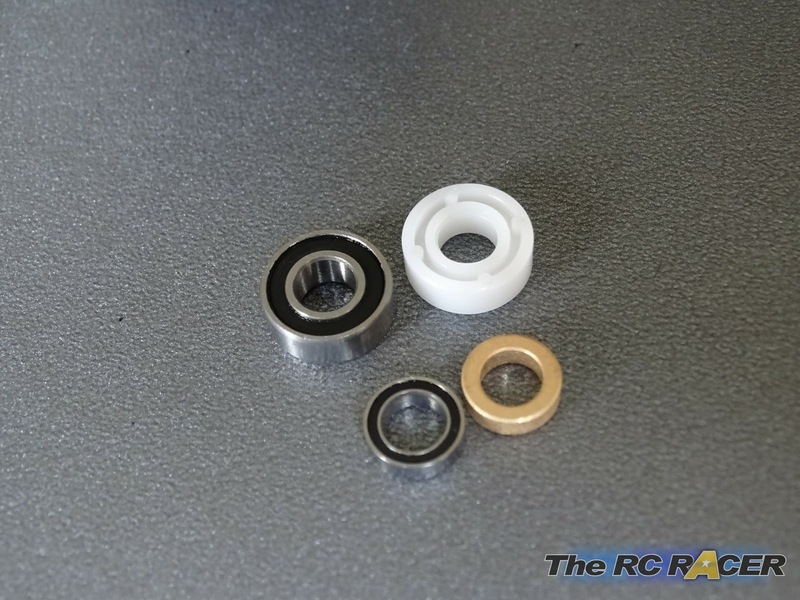 These have bearings mounted on them along with E-Rings to hold the spacers and bearing in place. They all fit snugly in the plastic casing, just take your time to ensure that everything is positioned correctly and they will rotate smoothly. Now its time to fit the rear propeller joint. Again you want to add some grease here to ensure that the gears mesh smoothly and suffer from very little wear. Once installed its time to add the top cover of the axle with eight 3x10mm screws. A Universal joint is now attached to the prop joint with a 5mm grub screw. I used threadlock on this grub screw to ensure that it will not come loose with any vibrations. Also its time to add the rear links to the axle. They are made with a soft plastic to help articulation. They also have 8mm balls trapped in them to aid the free range of movement. 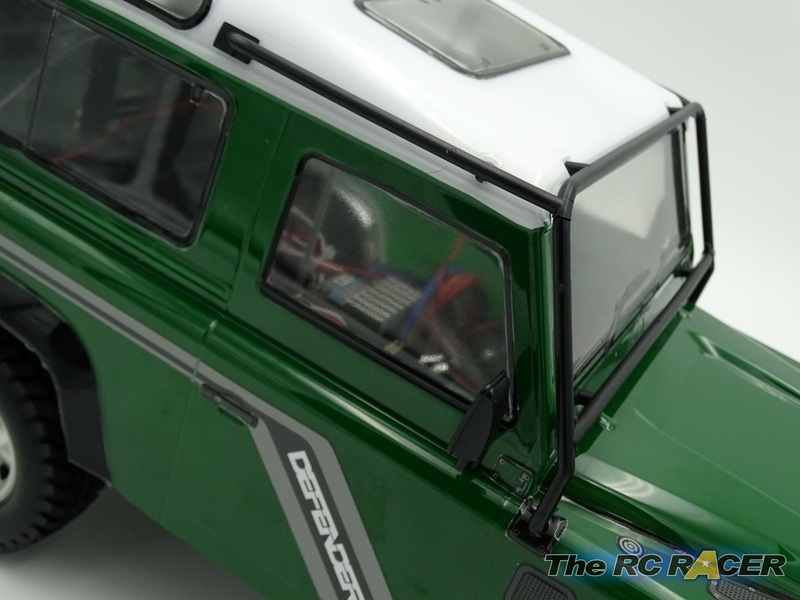 The rear bodyposts are added and now its time to attach the rear axle to the chassis. 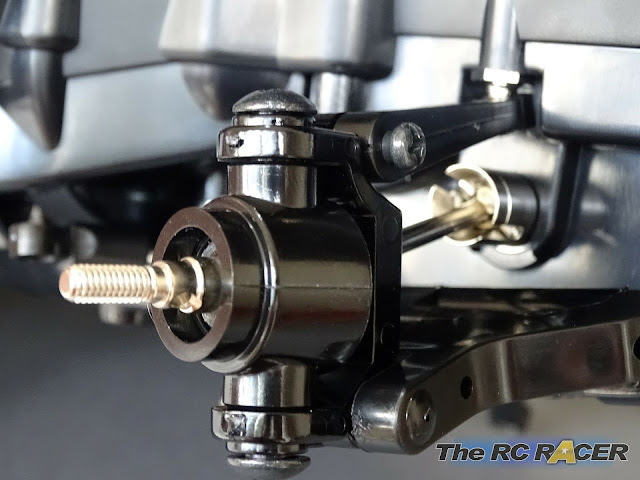 You need to clip on the upper links (Part D6) onto the ball connectors and then use the screws to hold the longer links onto the chassis. 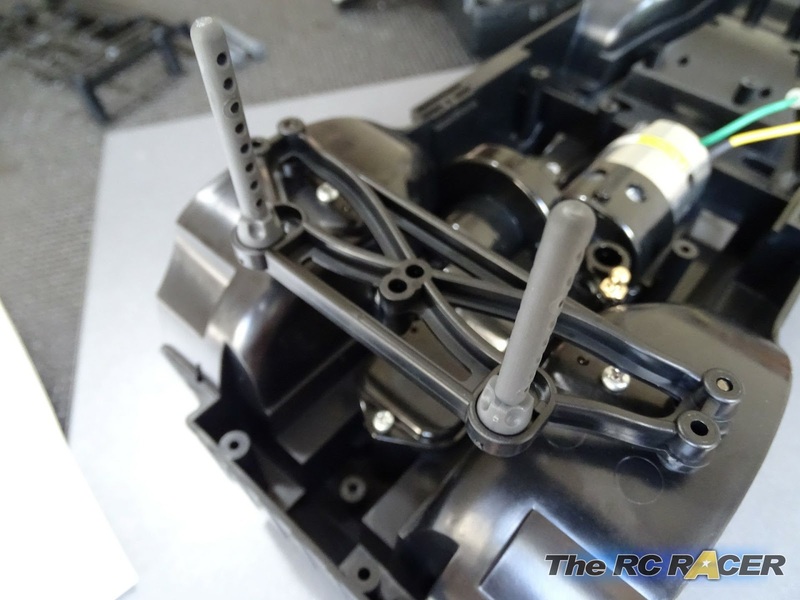 The final thing to do is to connect the prop shaft with the 5mm grub screw (thread locked), and we now have something that resembles a full chassis. Onto bag D, Here we will be building the oil filled dampers. These ensure that the D90 will not be bouncing around. 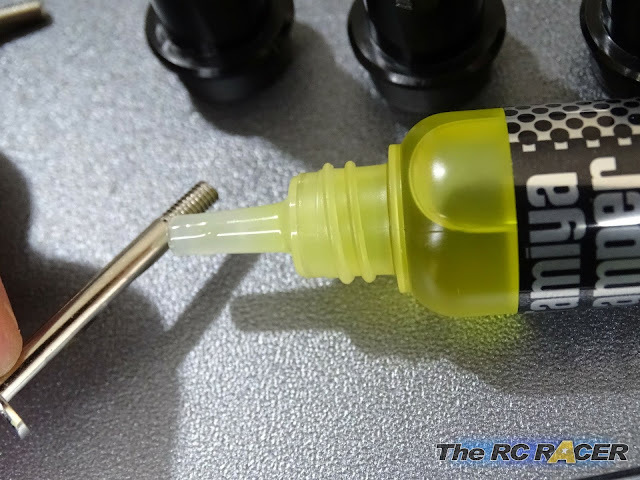 There are not many parts to assemble, so just take your time to get leak free smooth shock action. To help keep it friction free just add a little to the damper shaft. I usually pop a drop on my fingers and just rub up and down the shaft a couple of times to check its lightly covered. 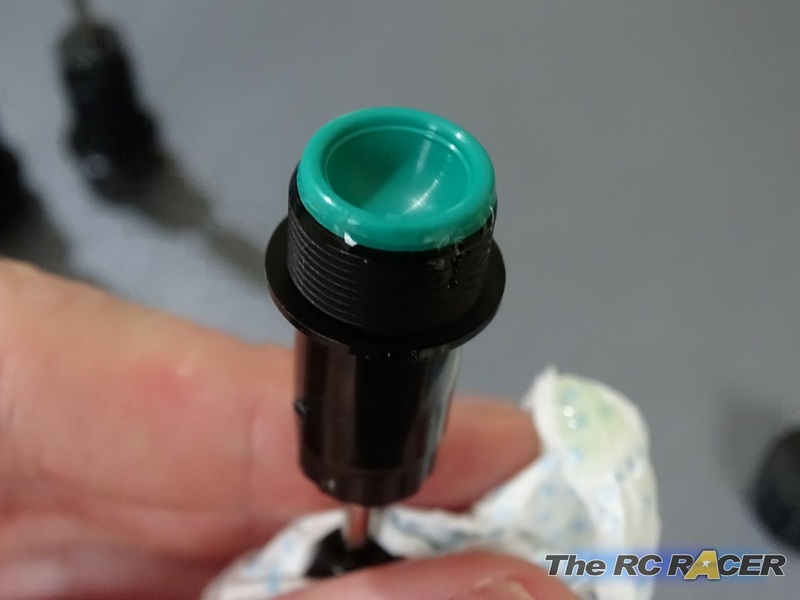 Attach the lower damper cap (that holds the o-rings in place) and then slide in the shaft gently, once it is through you need to add the black o-ring over the end. (this is just to limit the maximum shock movement). Attach the lower ball mount onto the shaft. I usually use a piece of kitchen roll to stop scratching the shafts. Otherwise you could scratch them, which may tear the o-rings and potentially leak out shock oil. Now fill the shock with oil (Just to under the rim), just let it settle and move the shaft up and down a few times to get rid of any bubbles. 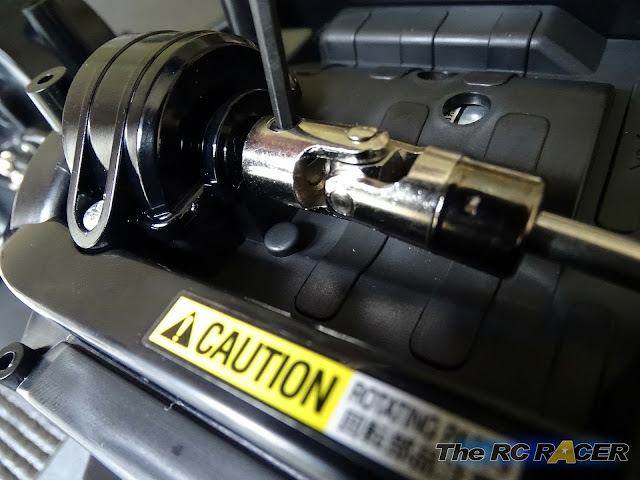 After the oil is settled, just attach the oil seal. 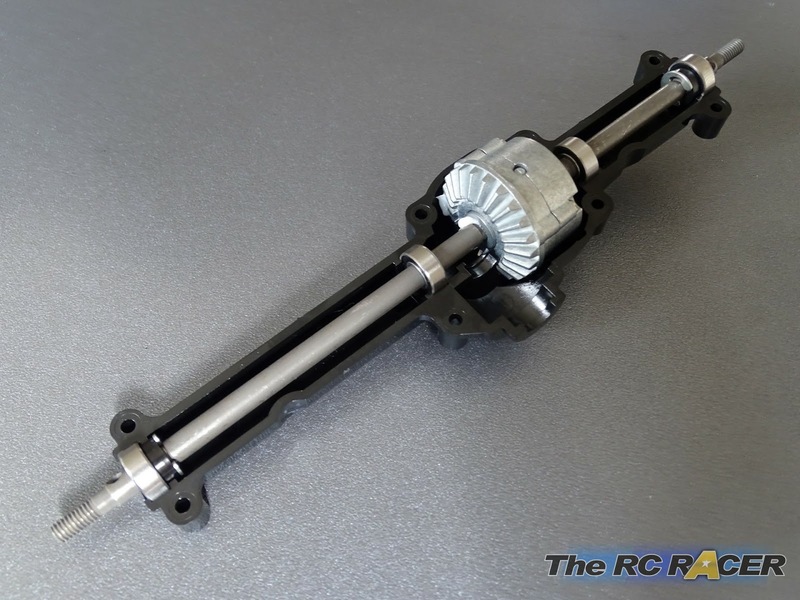 You want to ensure that the shock shaft is fully extended down at this stage. There will be some spillage as the oil seal sits onto the top of the damper cylinder. Tap the seal until it is seated nicely. Wipe up the mess and attach the top. Rear shocks on the left, front shocks on the right. 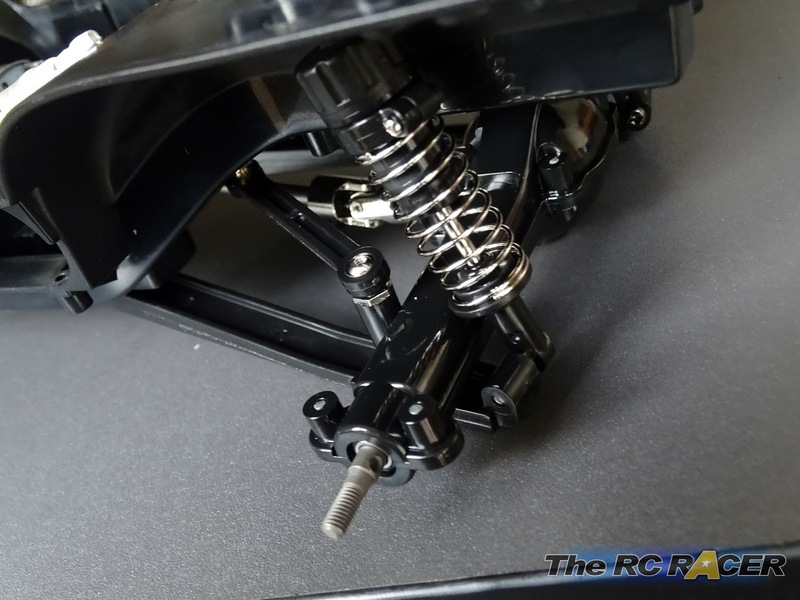 Now you just need to add the springs and the adjusters (Note the front and rear springs are different, the front is softer and the rear are stiffer (less coils). 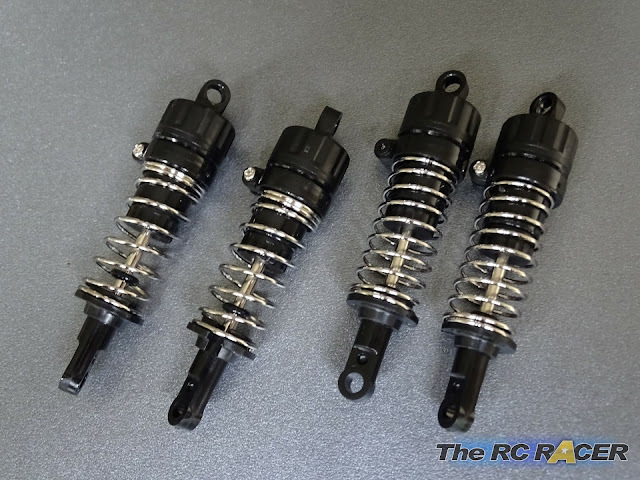 Your final result are a set of smooth leak free shocks. These are then mounted onto the front and rear of the chassis. At this stage you can see the articulation and movement of the suspension. You just need to add the wheels and bumper and you have finished your chassis. Time to fit the electrics. First up we need to fit the steering servo. These do not come with the kit so you will need to purchase one of these alongside a radio transmitter and receiver. For the build I used the Carson reflex stick Pro 3.1 radio transmitter set. This the best value stick set out there in my opinion. 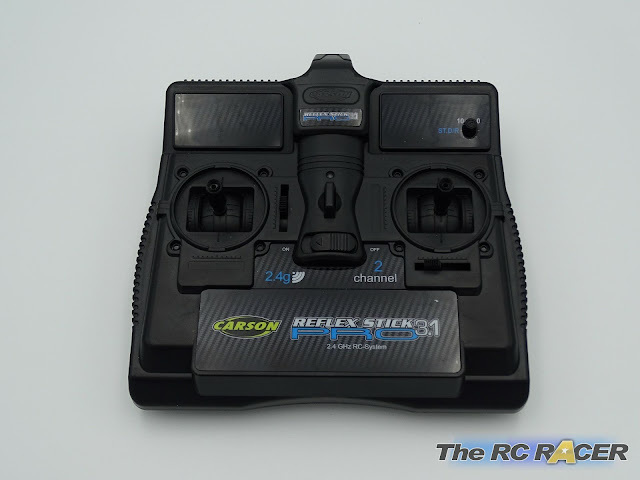 You get a lightweight stick controller that features dual rate (used to control the amount of maximum steering throw), a lightweight receiver and a std servo. 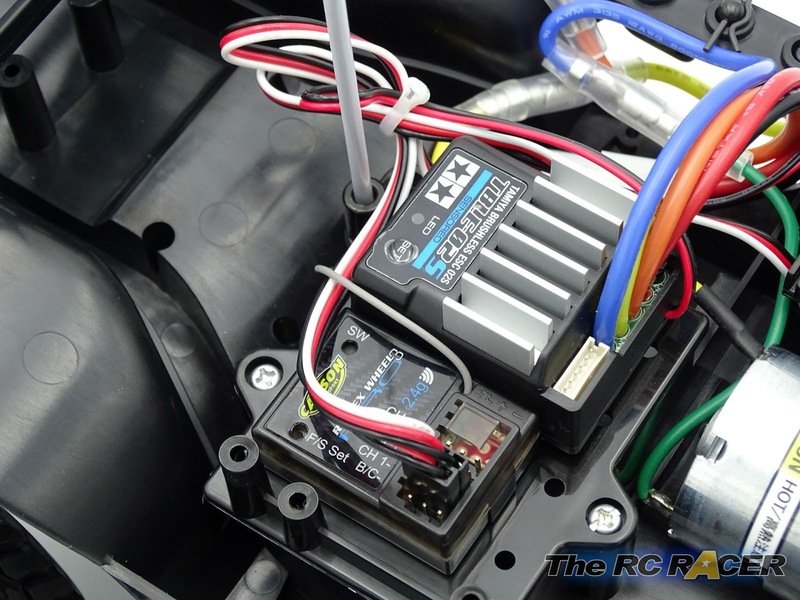 It runs at 2.4ghz so you do not have to worry about radio interference. We also need to fit the electronic speed controller. 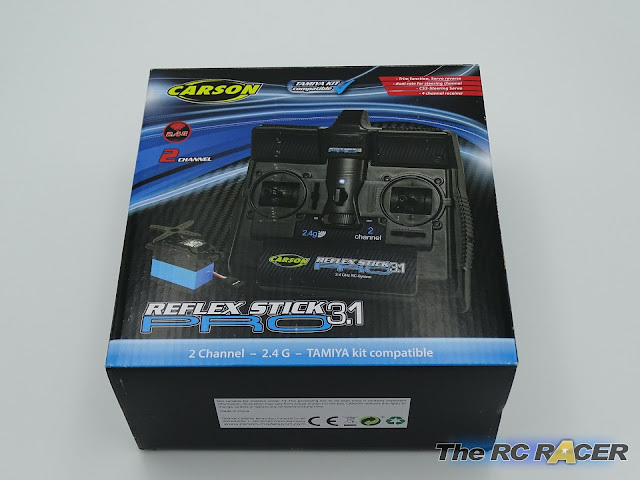 Tamiya includes one of these in the box, the TBLE-02S is a good esc that can run sensored brushless motors. 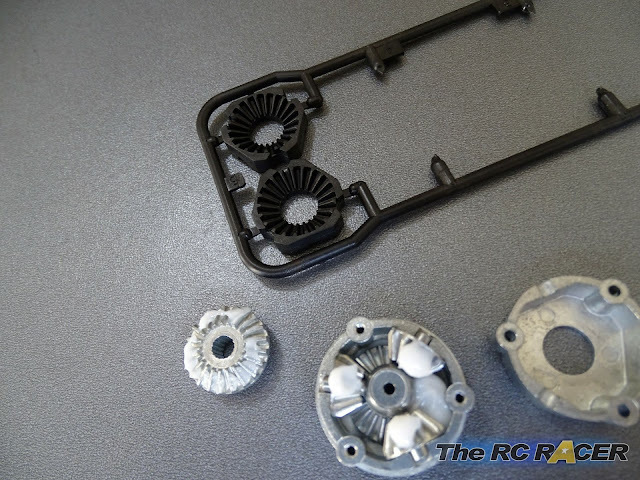 Although for trail running most will keep to the brushed motors that come with the kit. 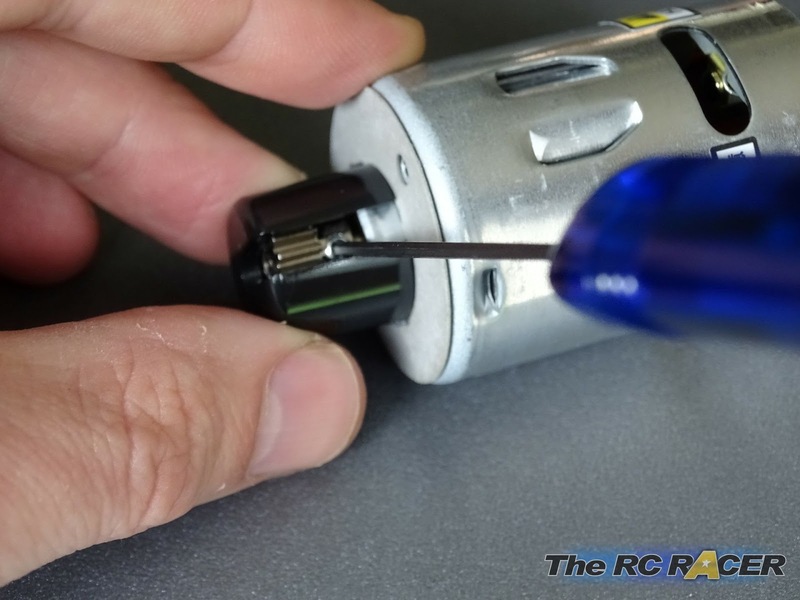 Its very easy to set-up, when attaching it you want to connect the blue lead to the green motor lead and the yellow lead to the yellow motor lead. 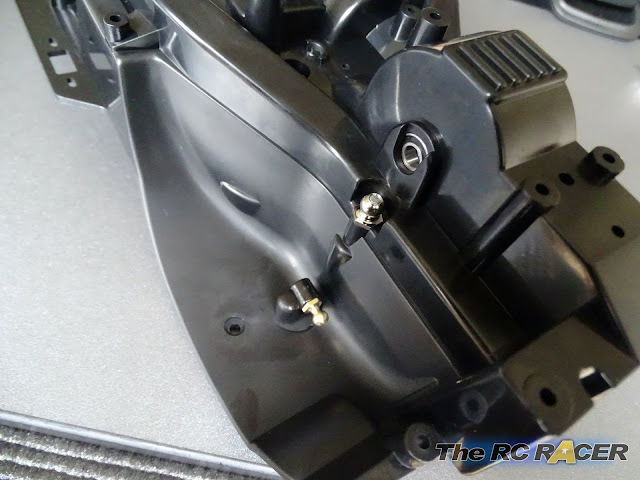 The esc is mounted on a chassis plate, and there is plenty of space to fit the receiver. Now it's time to do the bodyshell. The main shell is made from poly-carbonate, which is resilient and also lightweight. There are a selection of plastic parts that you need to attach that add detail to the final shell. First up you want to cut the shell. Once you have trimmed it around the cut lines, you want to give the insides a wash with warm water that has a drop of washing up liquid. Once this has dried you need to fit the supplied paint masks for the windows and headlights. (Note the manual tells you to drill the holes in before painting, I actually prefer to do it after as I find it less likely to have any paint running. As this is a poly-carbonate shell, you paint it from the inside. When doing this you want to paint the darker colours first, and then move to the lighter colours. So if painting this shell as per the kit, you want to mask off the roof section with some masking tape (Tamiya masking tapes are great for this). Then you would paint the green shell (Several light coats, 30cm or so away from the plastic). Once dried then take of the roof mask and paint the roof white. Then you can remove the window / light masks and work on painting and fitting the other plastic parts. The best tip for a great shell is to take your time. The shell took me longer to do than the actual chassis, but the final result is fantastic. The external parts are sprayed with Tamiya Semi Gloss black. It takes the shiny edge from the plastics and makes the shell look great. The external plastic parts really add a great amount of detail to the already impressive shell. 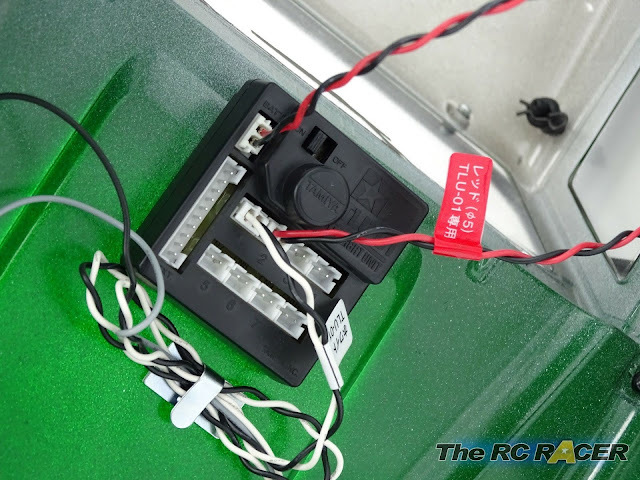 This kit also includes the LED light system. In the kit you get a pair of white and a pair of red LED's that can attach to the kit. You can buy more sets to add to the unit if you want to light up the rear more. I mounted the Light unit under the front bonnet. You get a set of cable tidies that ensure you can hide the wires and guide them around under the windows. The model is finished, it looks great. The Tamiya Land Rover Defender 90 is on an all purpose chassis so it can go just about anywhere, but I was I couldn't wait to get it out to see how it could tackle suitable terrain. Luckily I live near a nice local piece of countryside with a selection of different surfaces to see how the Landy D90 would cope. On the smooth surfaces the kit 540 motor soon runs out of puff. Its still much quicker than you can walk. However the acceleration is good and a blip of the throttle still allows you to slide it when on gravel. 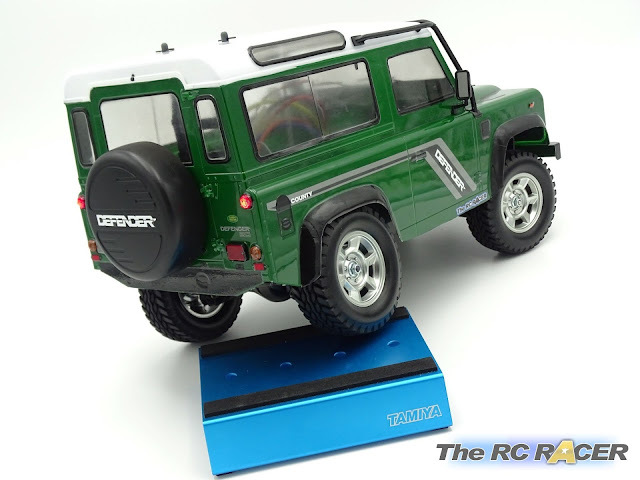 The throttle response overall is actually very good, when climbing steeper slippery surfaces you can find the bite point easily and precisely use the throttle to find the grip. 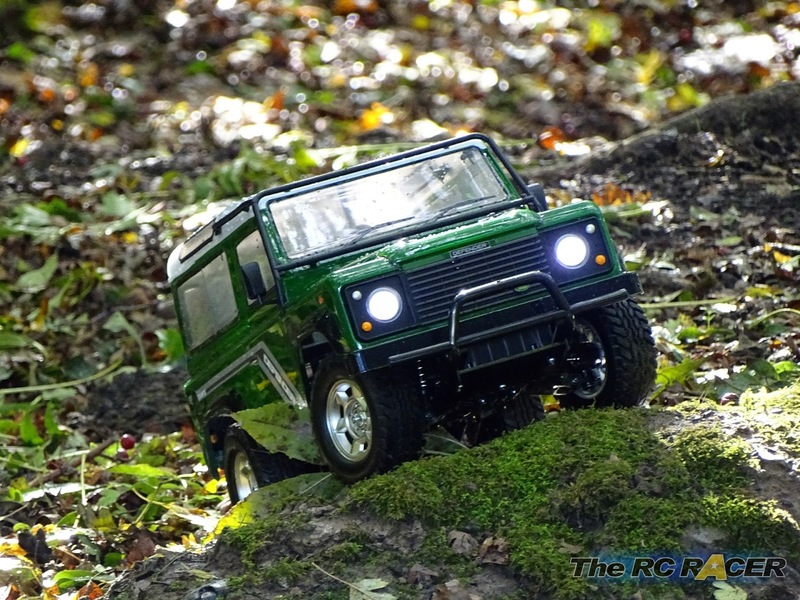 Despite the locked rear differential the steering still felt responsive and precise. 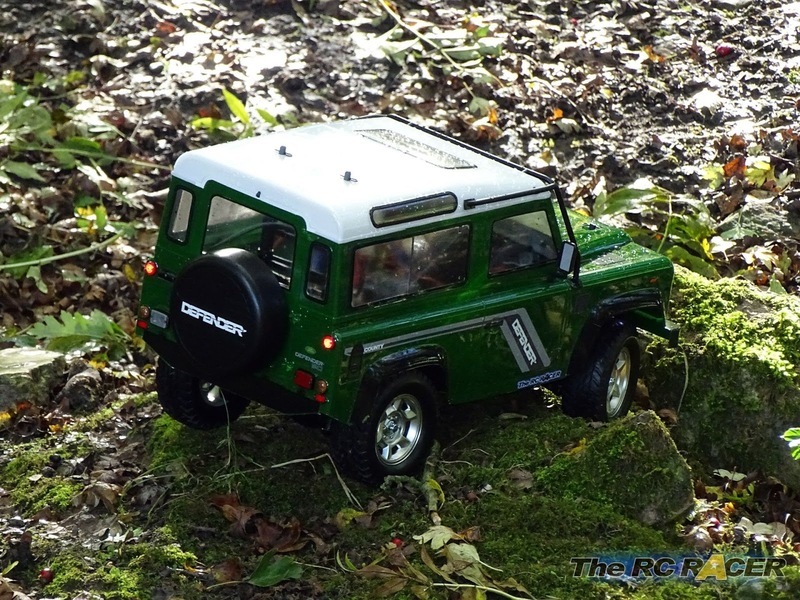 The Carson servo was able to turn the wheels, even when the Landy was getting tangled in long grass. 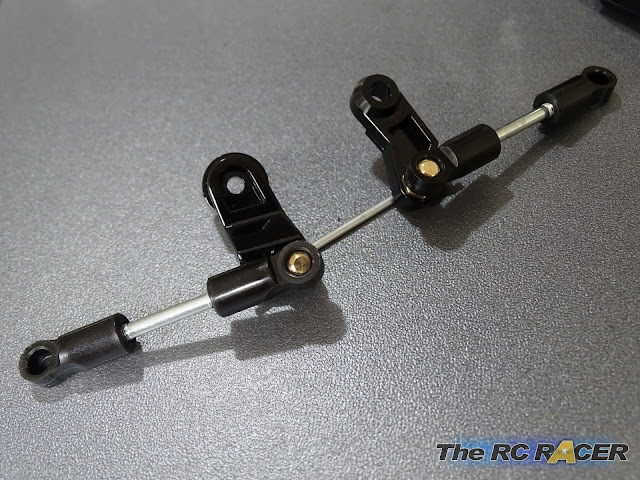 I did dial out some steering throw with the dual rate as I found that full lock was too much and it would slightly bind the front suspension. I still had the steering at near 100% but just stopped it over extending and pushing against the C-hubs. The D90 seemed to handle really well on all of the surfaces that I took it on. On the flat tarmac it was surprisingly good fun, with just the right turn of speed to ensure it would stay on all 4 wheels. As soon as it went onto more bumpy terrain the oil filled shocks did their job keeping the D90 nice and stable. I actually found myself driving quite quick on the more rally orientated surfaces and even managed to grab a small amount of air. When it got to the more demanding surfaces, much like the real life equivalent you need to slow down. 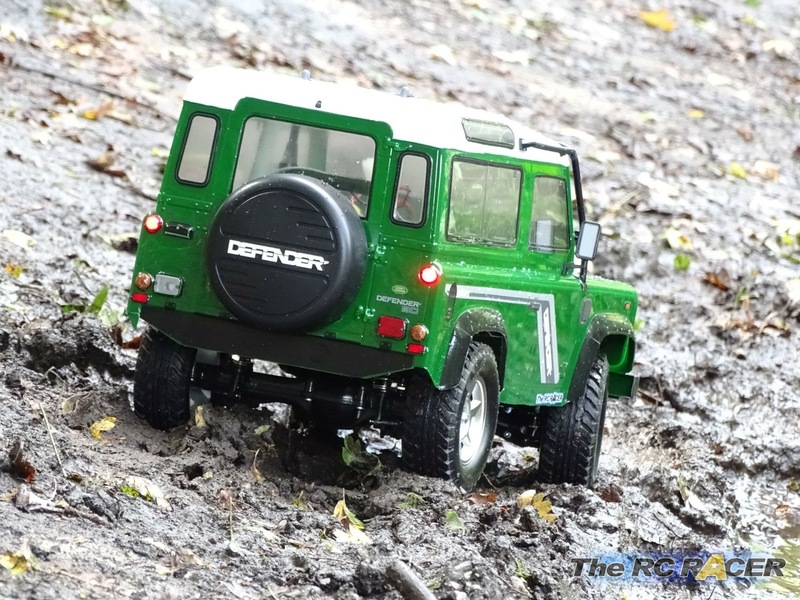 The 4WD drive train never let me down and the weight distribution felt very similar to the real thing. 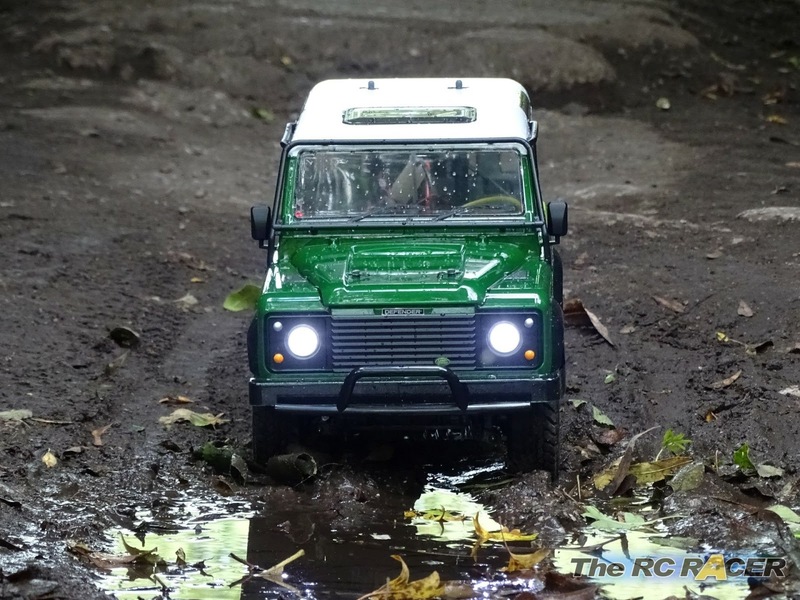 The Tamiya Land Rover would just not want to give up. Even on larger obstructions I found myself able to gently ride the truck up against it and blip the throttle, pushing it up and using the lower skid plate to help the D90 gain its much needed forward momentum pushing it over the seamlessly unassailable hazard. 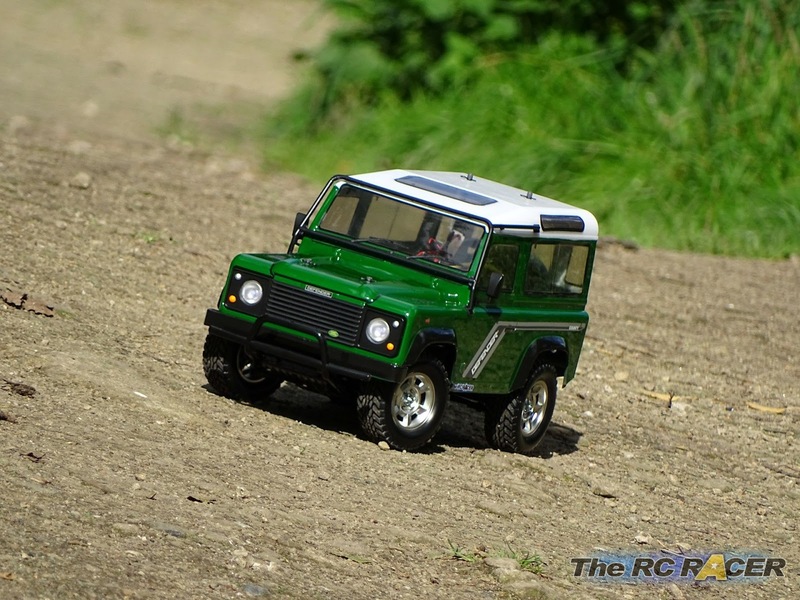 It was fantastic looking at this beautifully detailed model tackling the craggy surfaces. The suspension was still doing a great job, and I was surprised at how capable the standard kit was at conquering some impressively difficult and terrain. 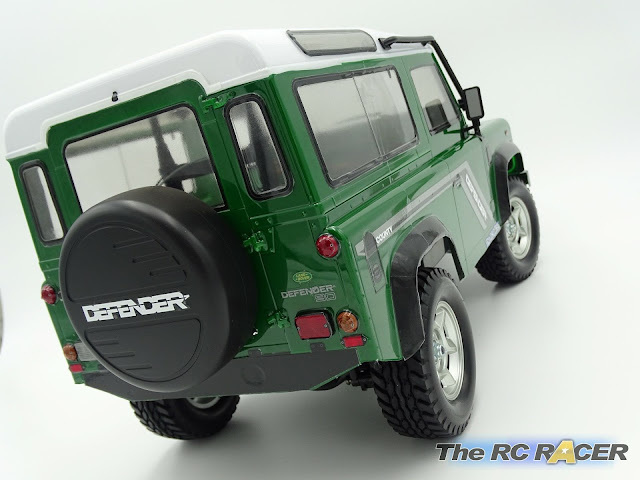 It really captured the spirit of the Land Rover Defender. The CC-01 chassis is incredibly durable and it had no problems coping with anything that I put it through. 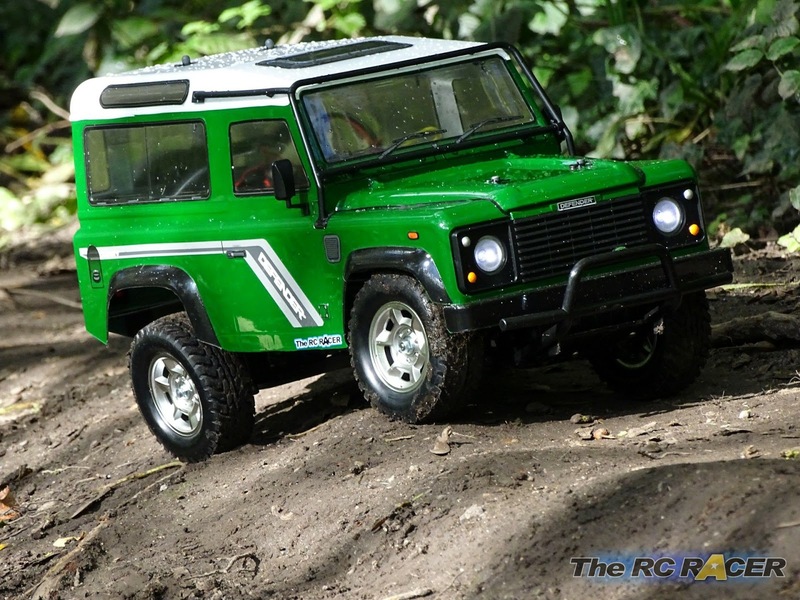 This chassis is made to take a fair amount of abuse on the trails and despite some large misadventures on the test runs (Including a big tumble down a large quarry hill), nothing broke and it stayed fully functional in all those hours of running. 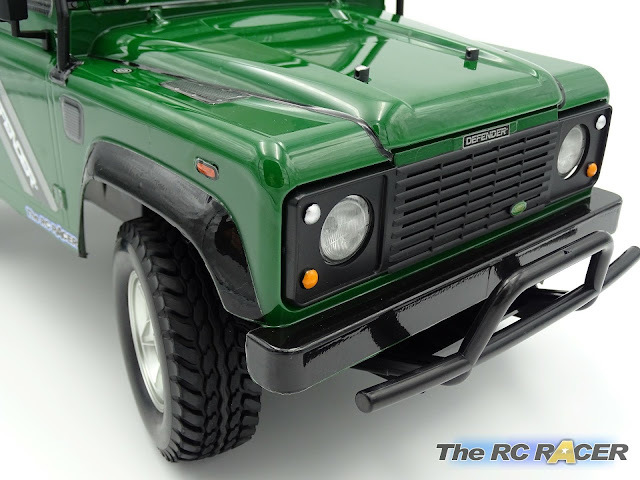 Tamiya have excelled in producing a great looking representation of the classic Land Rover Defender, its well specified and also is very competitively priced. 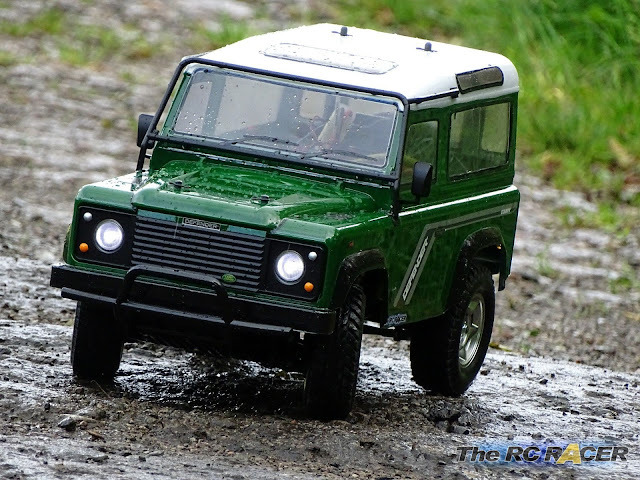 It's not just the looks that capture the Landy, the handling is also representative. It is really enjoyable driving the D90 through the mud and up and over obstacles. 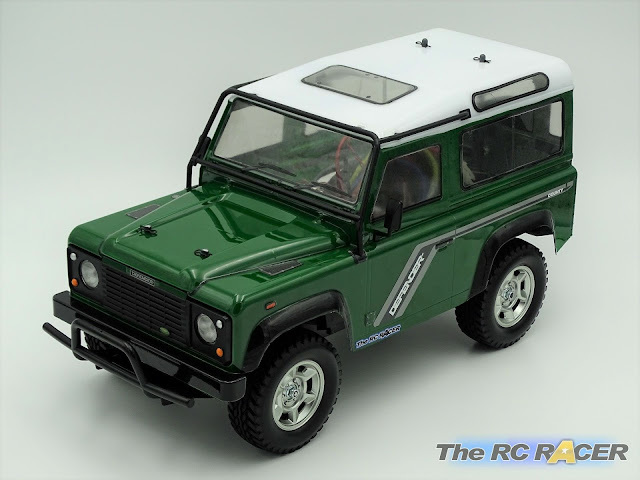 There is more than enough speed and power to ensure that you feel that it is an accurate scale model of the real thing. The larger obstacles are challenging and that provides a great deal of driving satisfaction. I soon lost many hours driving this truck as it is really enjoyable. The Tamiya CC-01 chassis has been around for a while and Tamiya make a selection of Hop-ups (Tuning parts), that are able to enhance the performance even more. So just like the real machine you can customise the Landy even more, making yours unique. 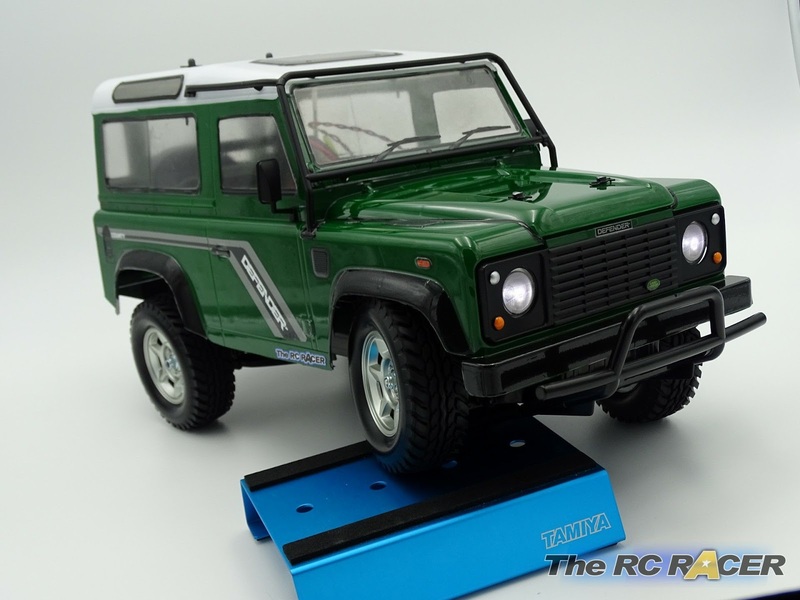 If you want to get a Tamiya Land Rover Defender 90, they are available from your local UK Tamiya Stockist. 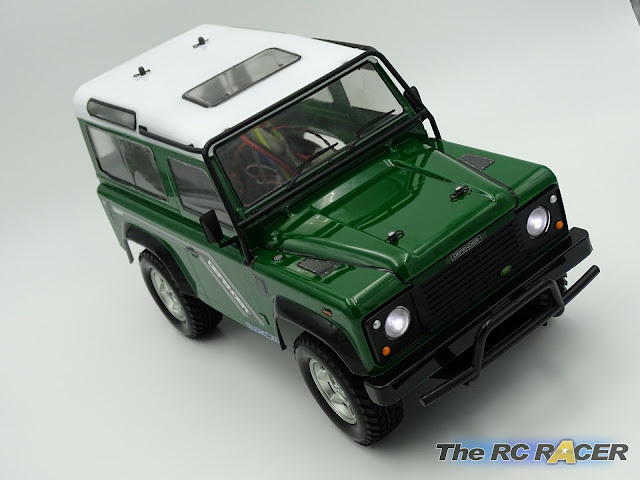 Contact http://www.hobbyco.net/ for more info.